Symphonic Death Metal is oddly underrepresented as a genre. Sure there are tons of melodic death metal bands with keyboardists who throw in the odd symphonic bit here and there for style, but few take the idea to its extreme with fully orchestrated death metal opuses. 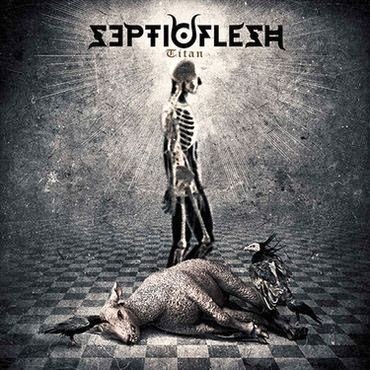 With the release of “Titan” Septic Flesh have once again proven to be an exception to this rule. Perhaps taking a note from fellow Mediterranean death metallers Fleshgod Apocalypse (whom they are currently touring with) Septic Flesh have amped up the symphonic aspect of their music to eleven on this one, with the sound of swelling strings and thundering trumpets being as prevalent as that of blast beats and machine gun guitars. This proves a huge boon to the album as a whole and certainly helps it stand out from previous Septic Flesh releases a bit better than it might otherwise. This is not of course to say that there isn't some blood boiling death metal ferocity on this album. Tracks like “Burn” and “Prototype” are brimming with ferocity, which when mixed with the grandeur of the albums sound makes for a very compelling aesthetic. The traditional Septic Flesh style is certainly there when it comes to riffs and song arrangements, although there are some surprises such as the Cradle of Filth like melodic riffs later in “Burn” and the gypsy violin and harpsichord interlude in “Order of Dracul”. "Confessions of a Serial Killer" is also worth noting as by far the most interesting track on the album and possibly one of the best tracks from Septic Flesh to date. The combination of incredibly heavy riffs with strange unsettling orchestration and eerie lulls in the heaviness culminates in a truly frightening and engrossing listening experience, and the immense talent of Christos Antoniou shining through more than ever. While the album doesn't break much new ground when it comes to the metal aspect of Septic Flesh’s sound, it certainly pushes the symphonic aspect farther than it’s gone before and take’s the band into new and interesting territory.